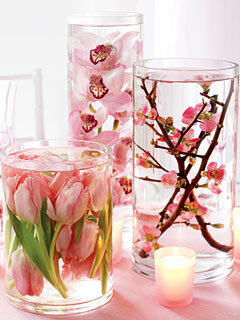 An idea that works well for tall modern arrangements is to submerge the whole flower in water. This can be tried with tulips, roses and cymbidium orchids. The water will start to cloud after a day or two so don't prepare them too long in advance. A Sinking Solution—Did you know that many cut flowers can thrive under water? That’s right—totally submerged! Tulips certainly can. (So can lilies.) One flower per case is usually most attractive. To display a cut tulip under water, select a tall clear vase, then cut the tulip’s stem to a length which allows the whole flower and stem to fit within the vase. To hold the flower upright and under water, weigh down the stem base by wrapping a metal band around it or tying on a stone or fishing sinker with wire. Carefully lower the flower stem first into the vase. Hold the vase at an angle and slowly add cool clean water until the vase is filled. The bloom will last for up to a week in cold clean water.